I’ve been finding myself make a little more effort with my eye makeup lately, I’m not sure whether it’s because it’s Summer time or if it’s just because I’m a little bored of the liner and mascara look. I have been wearing a lot less makeup lately and when I do decide to jazz it up a bit I actually remember why I love makeup so much and feel the need to experiment and branch out with a bit of colour. I have so much makeup and tend to stick to a lot of the same things, I’m not quite sure why so I’m definitely going to be shopping my stash in the up and coming weeks so I’m excited! Let me talk you through a few of the shadows I’ve been loving lately and why. I was considering doing a whole post on this shadow because I have been so obsessed with it ever since I got it but I thought I’d share the shadows I’ve been wearing it with also to give you some inspiration. Nylon is a gorgeous frosted white gold shade that is a must have for any makeup collection, the colour actually reminds me of Mac Vanilla Pigment which if you’ve been reading this blog since the start you’ll know it’s been a huge favourite of mine for a while. Nylon however is a lot easier to work being a shadow rather than a pigment and it’s just so stunning, I use this as a brow highlight, inner corner/tear duct area highlight and the texture is buttery soft it really brightens up the eyes and finishes off the makeup look so perfectly. Such a stunning shadow and I’d highly recommend adding it to your collection, I don’t know why it took me so long to purchase! I have quite a collection of ABH shadows and one of my most used has to be Sienna, I have it in single shadow form but it also comes in a few of the ABH palettes also and I can see why. It’s such a great transition shade I love to use this on my crease area as it works really well with all of the warmer toned shadows I use. It is very pigmented and blends really well, a great shadow and perfect for those with blue eyes it really makes blue eyes stand out. Finally a couple of brushes I’ve really been enjoying for my new found love of eyeshadow application have been from Crownbrush, I have quite a few brushes from Crownbrush and these are the latest to be added to my collection; the C411 Pointed Blender and the C441 Pro Blending Crease brush. I mean firstly the price of these brushes at just under £5 each your getting a complete bargain and the quality is fantastic, the shorter more dense bristles on the Pointed Blender brush really makes precise shadow application a dream and the Pro Blending Crease works really well to blend out shadows and get rid of any unwanted harsh lines, both super fab brushes! 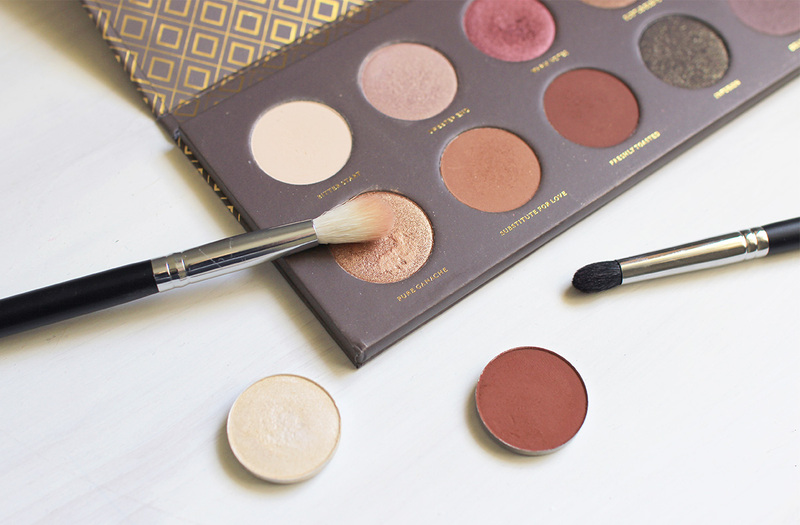 What eyeshadows and tools have you been loving lately, do you love cool or warm toned shadows? I think these shades are just perfect for the Summer!